Fancy a Hen’s Party with a difference? A Hens Day that will leave lasting and incredible memories and show a girl a good time! Here at Urban Quest, we run Hen’s Parties that are unique, customized and tailored to the Hen of the moment and involve an amazing race. So, if you are looking for a Hen Night to remember that brings a unique experience, then think Hen’s Party Melbourne! You tell us what you want and we shall provide it. No request is too big or too difficult. We customize the Hen’s Party Melbourne by gathering as much information as possible about the Hen from friends and then use this to include it in the game. We do the hard work so you don’t have to and once gathered, will put our creative brains together to come up with some individual and imaginative tasks and challenges that are linked to the personal preferences of the Hen. Tasks and challenges that are personalized are more exciting and resonate more with the individual in the spotlight. Once finalized, your group of Hens get to experience tasks and challenges developed specifically for the Hen. It leads to an unforgettable Hen Party Melbourne! For example riddles may be made up that only friends would know about or there can be challenges that target a particular skill of the Hen. This makes the person feel special because there is a challenge included in the game that they shall excel at. Sound like your kind of Hen Party? One where the Hen is the center of attention with everything revolving around her? Then think Hen’s Party Melbourne. Here at Urban Quest, we offer a totally unique and tailor-made event that you will never forget. At the Hen’s Party Melbourne, you will be part of a highly engaging, interactive and dynamic experience, which is all guided by smartphones. The challenges and tasks will involve the different mediums of video, audio, photo and other puzzles not available at paper-based events. Urban Quest has over 10 years’ experience in this industry, has a 100% customer satisfaction rate and runs events that are fun beyond imagination! Want to have a Hen’s Day or Hen’s Party that is lots of fun and a day to remember? Then think of an Amazing Race for Hen’s Party in Melbourne. The event includes a pre-start briefing and an award ceremony at one of the best pubs in Melbourne and therefore, normally lasts for around three hours. What better or more memorable way to spend a morning, afternoon or evening and one that the Hen will love you for. What a great Hen’s Party! Why Urban Quest? Why not? As far as we are concerned there is no other provider in Melbourne to match our offer. It is different, unique and individual, just like human beings and can never be classed as boring or run of the mill! 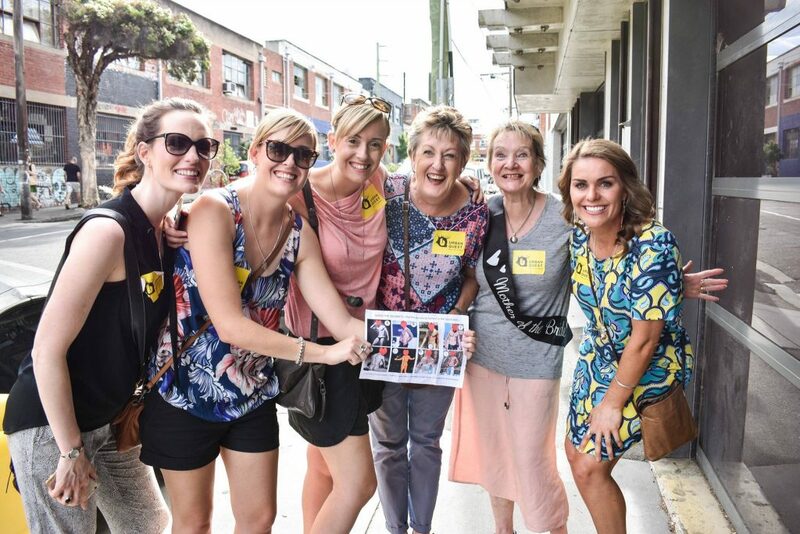 An Urban Quest Amazing Race Hen Party is an experience that will make precious lifelong memories and is, therefore, the best present a Hen could receive. Have an awesome Hen Party, Day or Night!